Get 2 Free Paper Glasses, Glow-in-the-Dark Wristband, and a Microfiber Case! Soak up the savings with our Ultimate Diffraction Glasses and Green Laser Pen combo deal, and have yourself a personal party! By combining our Black Ultimate Diffraction Glasses and Green Laser Pen together, we have created an all in one package for a good time. Impress your friends and family while you give them their very own personal light show! Featuring Ultimate Diffraction Glasses, which are made with True-Flex PVC making them virtually indestructible. 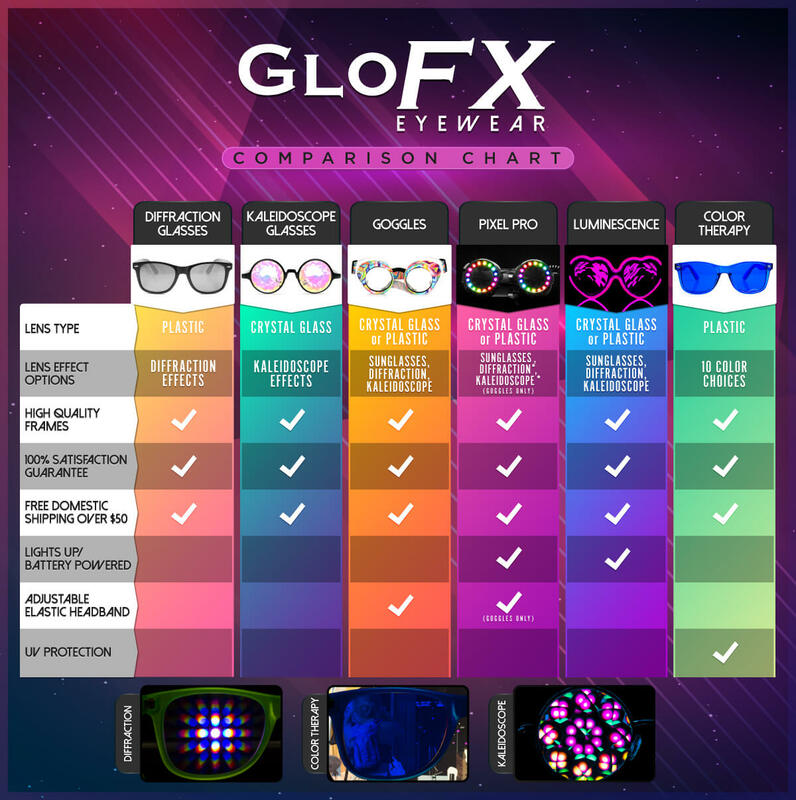 Our glasses are also covered by the GloFX Lifetime Warranty and GloFX Satisfaction Guarantee. Also included is our Green Laser Pen with 360° rotating kaleidoscope cap, giving you intense visuals and mind blowing patterns to impress anybody. Over stimulate your visual senses today and don’t hesitate because these summer deals won’t be around long! When combined, these products create an unreal effect not properly depicted by words, pictures, or videos. The gradient diffractive lens of the glasses when combined with the lasers using the Kaleidoscope cap, creates an actual 3 dimensional experience. Try not to fall into this insane galaxy of stars! For an even more intense experience, throw on your GloFX Glasses and shine your laser with kaleidoscope cap at a 3d surface such as grass, leaves on a tree, or a bush in your front yard. Your mind will be blown, 100% guaranteed! Trippy AF! Without a doubt worth the bucks.